More theater suggestions, one from a Gapers Block review, plus two music films. My rock and roll and film commentary is coming back. I’m working on something now about rock lyrics — and an essay on art and fashion is on the horizon. Not only is the Court Theatre’s new play showing in Hyde Park, Court’s home territory. Director Charles Newell has set this new production of Molière’s marvelous Tartuffe in modern dress in Hyde Park/Kenwood. (His name was really Jean-Baptiste Poquelin; Molière was his stage name.) The delicious touch is that Newell has cast the same ensemble of actors, mostly African-American, to play Tartuffe as performed The Misanthrope, the first play in the Court Molière Festival. Tartuffe is the religious fanatic hypocrite who almost takes over Orgon’s family and wealth. The acting is superb and the cast does a splendid job with Moliere’s witty dialogue. The mansion setting and contemporary costuming are beautiful … with the possible exception of Mariane’s and Valère’s outfits. Mariane, Orgon’s daughter, wears some silly-looking pink frocks (to emphasize her youth?) while Valère, her love interest, wears shorts he would never wear on the streets of Hyde Park and a White Sox cap that doesn’t know where to go. The two-hour-plus-intermission play is immensely entertaining. The translation by poet Richard Wilbur is the gold standard and isn’t hurt by some modern interpolations. The Tartuffe run ends this weekend. Beaten is a new play by Scott Woldman at The Artistic Home, a storefront on Grand Avenue. It’s a family drama about three generations of women living in the same home and provides meaty roles for Kathy Scambiatterra, Kristin Collins and Kathryn Acosta as grandmother, mother and daughter. The play runs at The Artistic Home, 1376 W Grand Ave, until August 11. 20 Feet From Stardom is about the mostly anonymous female backup singers behind some of the greatest bands of the 20th century. The 90-minute film directed by Morgan Neville features singers such as Darlene Love, Merry Clayton and Claudia Lennear, plus interviews with some of the musicians they performed with. It’s at the Landmark Century Centre Cinema now but it’s probably one of those films that will disappear from theaters after a short run. 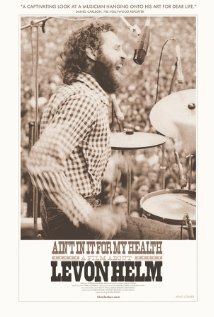 Ain’t In It for My Health is a film about Levon Helm, the late great drummer and singer with The Band. You’ve heard him on songs like “The Weight” and “The Night They Drove Old Dixie Down.” Levon died last year of throat cancer and was a musician until the end although he lost his voice in 1998. His Midnight Rambles at his home and studio in Woodstock, NY, were famous. The Levon film had three showings at the Music Box last month and I missed all of them so now I have to find it elsewhere or wait for the DVD to be released. You can find Levon’s music on levonhelm.com and if you want to see him in top form, watch the 1978 documentary The Last Waltz, directed by Martin Scorcese. Thanks for your comment. I don’t know why WordPress ate your first comment but I’ll try to figure it out. I notice you write on responsive web design — so I’m certainly going to check out your site.